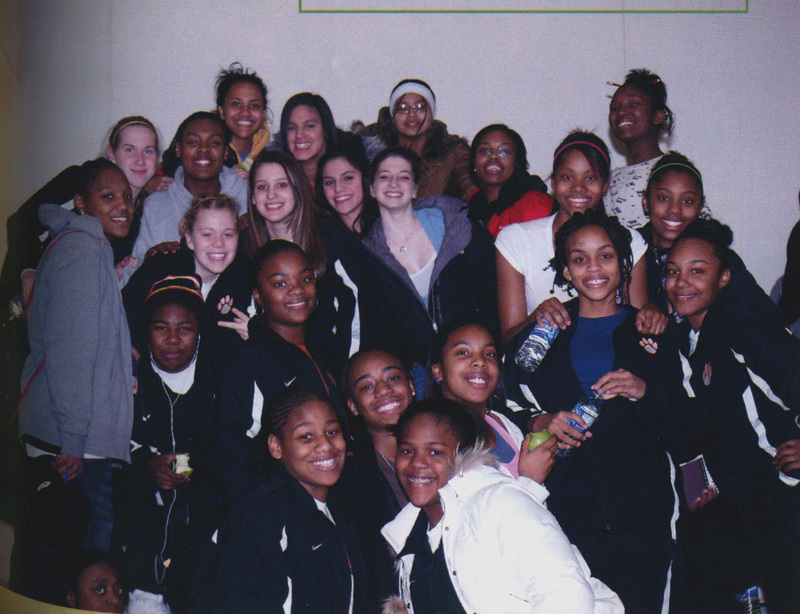 2007-2008 Varsity Basketball Team: Players names not published in the 2008 South yearbook. With most of the team returning from last season’s State 2nd place team, the season looked extremely bright. The team had high goals…..winning the State Championship. During the conference season, only one team gave the Tigers a run for their money. All the other games were won by more than ten points. The team AVERAGED a 45 point win in their 12 conference games. The first game was against Southwest. The Tigers only won by 38 points, 83-45. The second game, against Henry, was an 80 point win, 105-25. Then came the game against North, who lost by 57, 95-38. Washburn lost to the Tigers by 50 points, 81-31. Edison lost by 74, 116-42. The closest game of the year was against Roosevelt, the Teddies pushed the Tigers and only lost by SIX, 70-64! The second round of games was no better. Southwest’s 22 point loss, 72-50, was followed by a 67 point win over Henry, 100-33. North gave the Tigers a game, only losing by 16, 68-52. Washburn, 71-40, Edison, 113-50, and Roosevelt, 90-49, finished off the conference season and gave the Tigers a 12-0 record and the conference title for the third consecutive year. In the non-conference South was almost perfect, with one loss. The Tigers opened against St. Paul Johnson and won by 40, 91-51. Defending State Class AAAA champion St. Paul Central, who the Tigers lost in last year’s championship game was also a non-conference opponent. Everyone expected a close game of the top two programs in the state. However, this game was not very close. The Tigers were looking for revenge and earned it with a 72-52 victory. Roseville fell 68-51, as did Robbinsdale Armstrong, 65-40, Becker, 63-50, Woodbury, 66-35, Blaine, 64-36, and Eastview, 62-58. The only loss of the season came against Hopkins. The two teams battled back and forth the entire game. Hopkins though ended up with more points, winning 68-62. The non-conference schedule concluded with wins over Benilde-St. Margaret’s, 56-34, Eden Prairie, 74-68, Holy Angels, 106-72, and Bloomington Kennedy, 75-52. The Twin City game was a rematch of the earlier South-St. Paul Central game. This time both teams played hard and gave the fans an exciting game. South brought home the trophy with an 82-73 win. The Region tournament saw South playing three teams from the west suburbs. First up was Minnetonka. South was no match for the Skippers, winning 67-38. Wayzata fell next, 85-54. The Region championship game pitted the Tigers against Hopkins, the only team to beat them this year. Again, it was a close game, but this time South ended up on top, winning 51-42 and advancing to the State Class AAAA Tournament for the fourth straight year. In the first game in the State Tournament, South faced Owatonna. Owatonna held the high-scoring Tigers to only 57 points, but Owatonna only scored 46! The semi-final game pitted Chaska against the Tigers. Chaska held the Tigers to 64 points, but only scored 49 themselves. The championship game was a rematch of the 2007 championship game, with South taking on St. Paul Central. This would be the third time the two teams played during the season. Central did not want to give up their crown and played a tough defense, as did the Tigers. However, how much defense could these two teams hold the other down when both were scoring machines? In this game, defense gave way to offense. Central was held to 49 points, but South only scored 44! South had to settle for 2nd place again. South placed three players on the All-Conference team, Ephesia Holmes, Tyisha Smith and Tayler Hill. Hill was also named Metro Player of the Year by the StarTribune. Head Coach Ahmil Jihad was assisted by R. Sutton, C. Williamson, and B. Moore.